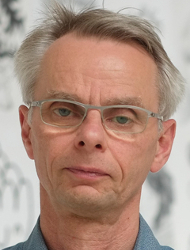 Since 1993, Dieter Daniels has been working as professor of art history and media theory at the Academy of Fine Arts in Leipzig. For more than 30 years, his research as well as his publications and exhibitions have been at the forefront of media theory and media art. As a GRC fellow at the Mainz Academy of Arts, Daniels will prepare a publication on transdisciplinary video theory. He and his assistant Jan Thoben also plan to organize a workshop on video theory and arts and regular video screenings at the Mainz Academy of Arts. Press release "Gutenberg Research College welcomes new fellows and presents the 2017 Gutenberg Research Award"